White Rose and Yellow 10k Gold Ring from Brazil, "Tricolor Ensemble"
This fabulous wide ring from the Biason Family of Brazil captivates with intriguing textures and visual effects. 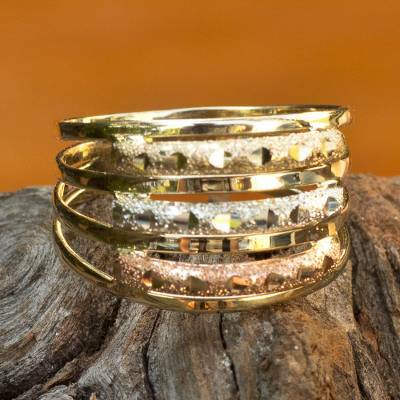 The 10k gold ring features yellow, white and rose bands with a sandblasted finish and discreet diamond-cut accents that add a brilliant shine. You can find tri-color gold cocktail ring 'Tricolor Ensemble' by Biason Family in jewelry categories such as Modern Rings, No Stone Rings, Gold Rings, Rose Gold Rings, Gold Rings, White Gold Rings, Gold Rings, Solid Gold Rings and Cocktail Rings. Enjoy exploring these sections for other Novica treasures. This ring from Brazil (Tricolor Ensemble, White Rose and Yellow 14k Gold Ring from Brazil) is exquisite. It looks really elegant, with perfect proportions, excellent handwork and finishing.